Prinz Waldemar!!! 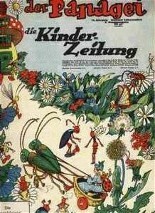 is printed by Steinsberg Verlag and Firma Glaus (Both from Vienna, Austria) in the child magazine "Der Papagei" in 1938 and 1939. It's the oldest PV publication in Germany. On a 36*25 cm format each issue has 8 pages of Prinz Waldemar. I am not sure till when or how many issues are printed. These issues are very rare. Value is around 50 Euro.